Moving an elderly loved one can seem like an overwhelming venture. Change is often hard on the older members of the family. To ease your transition we have come up with some tips from our years of service as San Clemente movers. 1. Involvement – You want to make sure involvement is consistent with every party. You want to have your loved one feeling like they are being communicated and given choices but also that you are supporting and involved in the move as well. 2. Organization and Scale back- Make sure things are organized in a way that makes everything easily accessible to your loved one. Cleaning out house and downsizing is difficult; you want to make sure you help with this process as much as possible. You can even use the 1 2 3 method of sorting. 1 is keep, 2 is maybe, 3 is donate. Then you take the number 2 pile (maybe) and split by keep and donate - giving your loved one time to reduce the amount of items they own in a non traumatic environment. 3. Plan Ahead of Time- Moving can be a stressful time, especially for elderly loved ones. You want to make sure the transition goes as smoothly as possible so planning ahead of time is key! Leave enough time so no one is feeling rushed or stressed – make sure there is enough time to move through your checklist at an appropriate pace. 4. 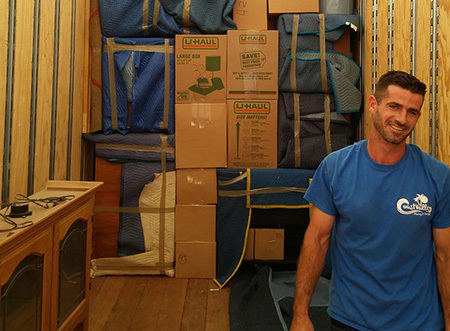 Picking an Appropriate Mover- This is one of the most important steps in the process. Since the moving process isn’t always easy for the elderly we want to make sure to take every step and decision with care. The amount of change happening is drastic and this can end up being incredibly stressful. When picking an appropriate mover you want to factor in things like customer service, experience, and reliability. As a seasoned San Clemente moving company we make sure to use our experience moving elderly family members and apply that to our customers. By assigning you a moving coordinator to walk you through the steps we make sure your customer experience is positive! Moving an elderly family member can seem like a daunting task but making sure you have an experienced and empathetic mover by your side makes all the difference. Call Coast Valley Moving and Storage for your free quote today!